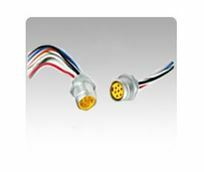 The MIN series is a popular connector choice for machine safety components, lighting, bus networks, robots, and numerous other applications. MIN Size II connectors include the larger 6 pole, and the 7 & 8 pole connectors. The size II are based on a 1.125" hex and a 1" thread for the plug.